Intrinsic noise measurement is one of the additional functions in the program Cross narrowband spectrum. It allows to evaluate the level of useful signal against the noise background with the use of spectral substruction. This method is implemented on software level based on the redundancy of two signals from two identical sources. Intrinsic noise calculation algorithm is based on recording of one and the same process with two identical instruments. In order to evaluate intrinsic noise level using the program Cross narrowband spectrum, it is necessary to place two identical devices close to each other. The theory of calculation process is as follows: the noises of the devices are supposed to be incoherent and their common signal is represented by background ground acceleration. This information is used for calculation of spectral power density of the output signal for each of the devices. Based on the cross-spectral power density of the output signal, it is possible to find a component that is coherent with the output signals of both devices, which is used for evaluation of normalized coherence function of the devices output channels. 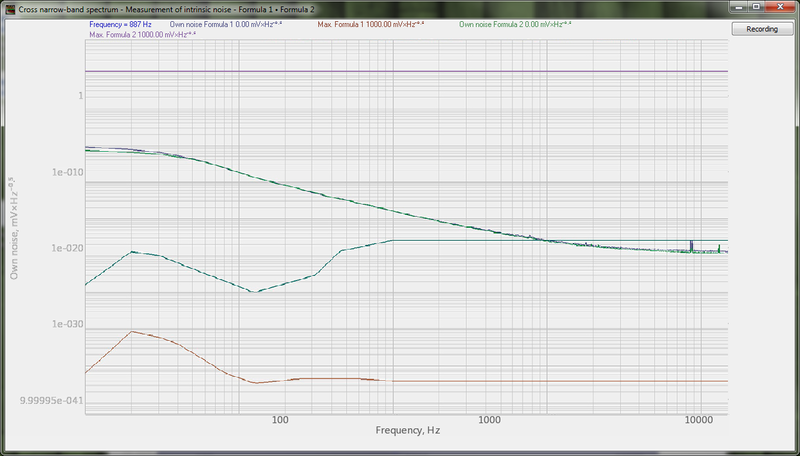 Then it is possible to calculate intrinsic noise level for each measuring channel. 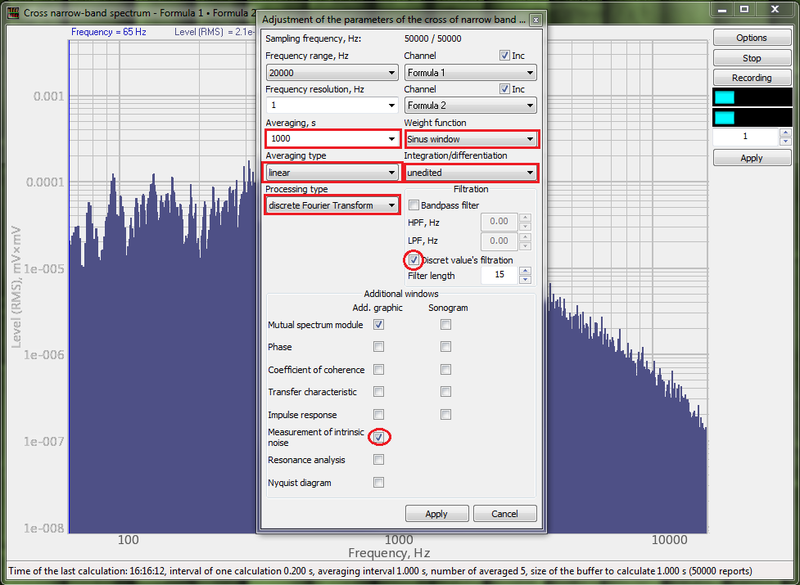 To activate the window of Intrinsic noise level measurements, activate parameters configuration window by clicking the key Options in the window of Cross narrowband spectrum program. Select the option “Measurement of intrinsic noise”. As the necessary parameters are set, click Apply key – you will see a dialog window of the program. In addition to the signals received from the input channels (in the case of the input channel measurement units are set as m/s2; m/s), the program also depicts NLNM (New Low Noise Model) and NHLM (New Hight Noise Model), as given by J. Peterson (1993). The program also depicts the maximal admissible level of measuring instrument intrinsic noise (in our case – that of FFT spectrum analyzer).